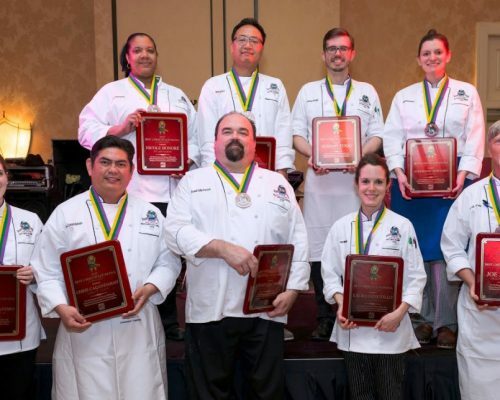 Congratulations to Emeril’s Pastry Chef, Jeremy Fogg Winner of the 2015 Best Pastry Chef of Louisiana! Helming the decadent dessert program at Emeril’s since 2014, Chef Jeremy Fogg has received rave reviews and accolades, recently winning the Louisiana’s “Best Pastry Chef 2015” by the American Culinary Federation for Emeril’s Banana Coffee Mousse Cake. Jeremy Fogg credits his family—and their large, food-oriented gatherings—as his culinary inspiration. An Orlando native, he attended Le Cordon Bleu culinary school, where he found his passion for pastry and baking. After graduating in 2008, Fogg began working at a restaurant in the Gaylord Palms Resort in Kissimmee, Fla., before moving to the hotel’s pastry department. After a few years, Fogg moved to the Hilton Orlando where he oversaw the pastry department for the hotel’s banquet functions, as well as the dessert menus for the four hotel restaurants. During that time, Fogg also owned and operated his own private catering company creating wedding cakes and desserts. Fogg moved to New Orleans in 2013, joining Emeril’s team in February 2014 before being promoted to Pastry Chef at Emeril’s in July 2014. The American Culinary Federation New Orleans is an organization of professional chefs that strive to make a positive difference in the Hospitality and Tourism Industry within the Greater New Orleans region through service and to serve as a conduit of culinary education and professional development through apprenticeship, mentorship, scholarship and certification. To learn more about ACFNO go to www.ACFNO.org. Call 504-528-9393 to make your reservation or go online above and join us at Emeril’s to enjoy lunch or dinner finishing with one of Chef Fogg’s amazing desserts!